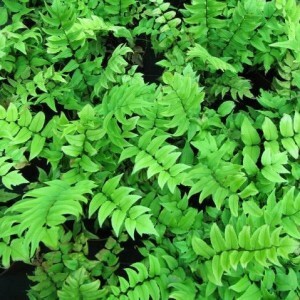 Cyrtomium is the unpretentious fern of the family of Shchitovnikovye, which is ideally suited for cultivation in room conditions. This plant is from subtropics of South Africa, Asia, Japan and China. Today, at least, 10 species of this plant are known. Cyrtomium grows up as a houseplant because the fern differs in the compact sizes and unpretentiousness. In height this plant seldom exceeds 50 cm. Leaves of a cyrtomium leathery and dense, have an unusual form thanks to which this plant sometimes call "fern holly". Brilliant motley vay of a cyrtomium in length reach also 60 cm. Stalks of this fern are covered with small hairs, they grow from the rhizomes which are underground.